Schooners once were anchored together so tightly in the tickle that one could walk across from the island to the mainland on their decks. From a thriving, busy and widely-known fishing centre, to a deserted, but charming beauty spot, it can certainly be termed Newfoundland's Lost Hamlet. All that is left is an allu­sion of prominent stories and memories of the past . Middle Arm obtained the name of the Three Arms that it represented. The initial community of Three Arms was settled mainly on an island. It was sep­arated from the mainland by a very narrow channel commonly known as the Tickle. However, settlement also occurred on the mainland after the community became popu­lated. The island became known as Back Tickle and the mainland became Front Harbour. Three Arms was known in the late 18th and early 19th centuries only as an ex­ceptional seasonal fishing site. It wasn't until the mid-19th century that permanent settlement occurred. There were two stages of migration. The first settlers were John B. Wells, William Wells and Solomon Strong. The Wells and Strongs originally came from Ringwood, England, and settled in Back Harbour, Twillingate. The story goes that John Wells married Solomon Strong's sis­ter and Solomon married John's sister. With their new families, both eventually moved to Three Arms for the fishing. At the time, fish were extremely plentiful in the Green Bay area, and Three Arms was a perfect harbour from which to operate an industry. Another member of the Wells family also settled here, along with his brother, to set up a family business. After Three Arms was settled, a man by the name of James Norris, originally from Waterford, Ireland, moved in from Petty Harbour - also to get involved in the fishery. He became a familiar large scale merchant. Youngs and others until Three Arms became the best known fishing harbour on the coast. John Wells was the first merchant to start up a business in the bay at Three Arms. For numerous years fishermen came from all over the region for supplies. Old account books still exist, dating back from 1862 to 1875, with dealers who came all the way from Round Harbour, White Bay, to Leading Tickles, Notre Dame Bay. These books are now believed to be in the possession of his great great grandchildren. John's great granddaughter, Mrs. Nellie Moore of Harry's Harbour, recently held these valuable ledgers, but she has passed them on to another generation. Mr. Wells also had the first post office in the bay. He once kept an old book, dated 1885, where he counted all the letters passing through his hands - both those received and those sent. His salary for that year was three pounds. When the business of Mr. Wells died out, James Norris, an Irishman, took over the merchant requirements in the bay. He expanded, and had much larger and far reaching results. Later, after passing the business over to his son, James Norris Jr., branch businesses were set up all over Green Bay and White Bay. At the time Mr. Norris' operation was the only local one. Ships came from all over the bay to trade fish for goods. He also had many ships built which were used in his business. Mr. Norris would send local ships, including his own, to St. John's with loads of fish, having them return with freight for his business. Also, ships would come from St. John's and other ports with shipments of freight to trade for fish. Fish was even exported all the way to Oporto, Portugal, by Mr. Norris. Three Arms was so immensely involved in the fishing and trade industries, that boat building was a natural progression for the local economy. John and William Wells were the first to build schooners. John set up a sawmill at Western Arm, and cut logs for himself and others. The brothers built five schooners in all, along with a large sailing ship called the Bulley. It is said that this old boat was later sawn in half. The stern part made a well-house for the Wells and the bow part made a well house for the Strongs. There is a unique story about the local boat building industry. John and William had a schooner called the Royal George. On a trip from Back Harbour, Twillingate to Three Arms with a load of provisions and household effects, the vessel caught fire. Since the cargo also included hay, the boat became a virtual tinderbox and could not be saved. The crew reached Triton with no loss of life, but the schooner and cargo were a total loss. As soon as the Wells brothers settled back in Three Arms, they started boat building again. They built a 40 ton vessel called Sweet Home, which was said to be the worst vessel to ever sail the seas, but it was the pride of John's heart. Once, on a trip to St. John's, John was going for a nap and he told William to keep a sharp watch. When he came up again, William was gazing out over the stern. John yelled, "Bill, I thought I told you to keep a good look out." "So I am," said Bill. "I'm looking out to see that no one runs us down." When the Wells business died out, James Norris, son of the original James Norris, the Irishman, started a merchant and boat building business. With headquarters at Three Arms, he set up other branch busi­nesses all around White Bay. He operated a fleet of fishing and trading vessels that were built at Three Arms. The first schooner was a 40 tonner, the Mary, built by a man by the name of Con Lake. There were 24 boats built for Mr. Norris with such picturesque names as Irish Lass, Alright, Ready and Go, Ellie in the Bay, Bonanza, Rover's Bride, Merry Heart, and Fuchsia. In the year of Halley's Comet, 1910, Mr. Norris had three boats built at 16 tons each. He had one con­structed for himself, named the Comet, one for the Stempleton family in Bonavista, named the Planet, and one for a Father Tickle, the Catholic priest in Conche, named the Mission. These vessels were produced by Charlie and Thomas King of Harry's Harbour. They were also fitted with marine engines. The last schooner to be built at Three Arms for Mr. Norris was the Nell, produced by Abraham Rideout in 1916. 1920's a boat builder by the name of John Rideout moved there to live. The story goes that he built over 60 boats, all from 15 to 20 tons. The remarkable thing about this man was that he did all the work him­self. He cut all his boat timbers and sawed all his plank with a pit-saw, single-handedly. He was known to have built a 23 foot boat in less than a month. It is also said that he built a boat for each year of his life - a remarkable feat. Three Arms was known for the first tele­graph office in the bay, and a very busy one it was. There were many active times at the harbour, when visiting men were all anxious to send messages home. All of these communications were worded in prac­tically the same manner: "Harboured at Three Arms; All Well". The telegraph operator for approximate­ly 20 years, Mrs. Nellie Moore remembers living on the island and having to row her boat across the tickle to the mainland to get to the telegraph. The rowboat was given to her by the government. After she got married the government sank a cable across the water and put the office in her house on the island. Jackson's Cove, Harry's Harbour, Silverdale, Southern Arm and wild Bight. These were then conveyed by telephone by the telegraph operator. Three Arms was a community that represented social togetherness between two families and two religions. The Wells family was Methodist ( Protestant) and the Strong family was Roman Catholic. The number of residents who followed each of these religions was about equal. The Methodist church was on the mainland, while the Roman Catholic church was on the island. Families often had to row across the tickle to get to their respective places of worship. Today, there still stand remains of the Roman Catholic church on the island, along with a cemetery that has many weathered head­stones. Three Arms represents a storyteller's paradise. The place teems with accounts of tragedy, happiness, great strength, prowess and humour. they may seem, his fantastic feats were well publicised around the Green Bay area. There is also the story of an old Irish­man who had his grave prepared about 25 years before his death. On his tombstone he had inscribed that he died at the age of 73, but actually he died at 85. For 30 years he had been a planter, for 20 years a sailor, and for 50 years he entertained strangers and shipwrecked mariners at his home in Three Arms. All together this adds up to a century. This man's headstone still stands today in the Roman Catholic cemetery. There are also stories of the great abundance of fish at Three Arms. Fish were so plentiful, as one story goes, that Grandmother Wells and Grandmother Strong put out a cod net in Green Bay one summer, and caught ten quintals of fish them­selves. 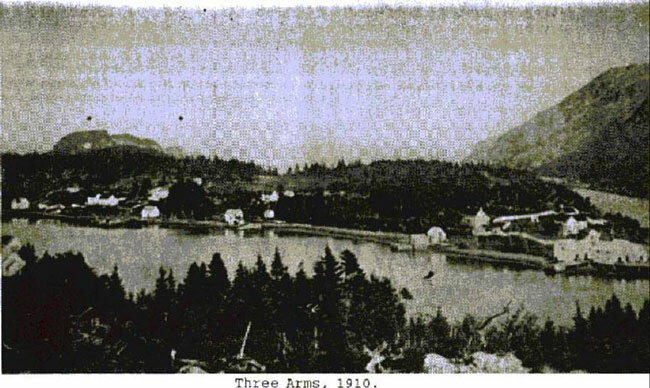 The first population count of Three Arms was taken in 1845, when 29 people lived there. This included 18 males and 11 females, living in four dwelling houses. From this point the hamlet grew, not just in population and housing, but also in industry. It's high point came in 1884 when the total hit 102 people. It was from this point that the settlement started its decline. There were only 47 inhab­itants in 1921, and the population decline continued until 1956 when the last people moved out. The Wells and Batstone families were the last to move away, relocating in Harry's Harbour and Jackson's Cove. They left on December 20,1956, occasionally revisit­ing during the summer months, but this practice also came to an end. leave, such as the Wells' and Batstones, uprooted their houses and situated them in surrounding communities. It seemed that, when the Norris family left with their business, there was no lifestyle for the people to depend on. In any other part of Canada, Three Arms would undoubtedly be an artist's para­dise. Few places in Newfoundland still exist which possess the breathtaking scenery which can be found in this deserted outport. Only the Methodist and Roman Catholic cemeteries are still there to prove to future generations that the prosperous little area known as Three Arms was once inhabited. And fill one with great ecstasy.